Subscribers are really an important part of a blogging. If we want to to grow our blog, we must use allow readers to subscribe our blog to receive daily updates and follow on various social media platforms. Default Feedburner subscription box is very simple. If we want visitors to subscribe our blog, we must use some eye catching and attractive subscription box. We also add an easy way for users to follow our blog on various social media accounts. In this post, I am writing about a nice WordPress subscription widget plugin. You can add an eye catching subscription box with the help of this plugin in the side bar of your blog. You can see the box in the snapshot below. 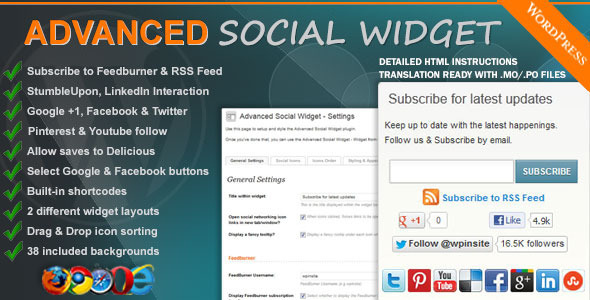 Advanced Social Widget comes with 4 widget layout which you can select from admin panel. It also has so many ways to customize the plugin with colors, fonts and icon sizes. It also has option for all popular social media platforms and supports feedburner for subscription. You can also set to open the links in the same window or new window. It also has 38 backgrounds to choose for the widget. Installation of this plugin is really easy. But the plugin is not available in the WordPress widgets. You need to download and then install it manually from the FTP.